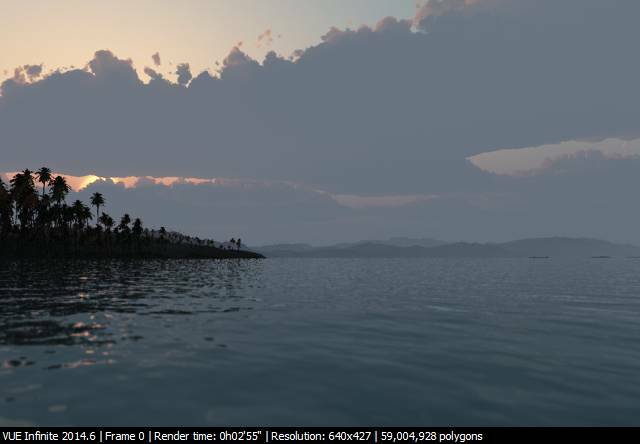 I recently stumbled upon a discussion thread on the Cornucopia 3d forum, showing render times for different computer setups on one of the scenes that ship with Vue: Seychelles. It is located in the Samples 1 directory. 2x Xeon E5-2687W 3.1 Ghz 16 (2x8) 64 Gb Quadro K6000 2015 Infinite 1'10"
Core i7 5930k 4.5 Ghz (oc) 6 32 Gb 2015 Infinite 1'45"
Core i7 4007k 4.5 GHz 4 32 Gb geforce Titan 2'57"
Core i7-4930k 3.4 GHz 6 64 Gb EVGA GTX770 2'58"
Core i7 2600k 4.4 Ghz (oc) 4 16 Gb 2015 Infinite 3'08"
2x Xeon (Mac Pro) 3.06 GHz 12 (2x6) 32 Gb ATI Radeon HD 5770 3'20"
Core i7 3770 3.4 GHz 4 32 Gb Nvidia GTX 670 2GB 9.5 Infinite 4'15"
AMD FX-8320 3.5 GHz 4 12 Gb Nvidia GTX 560 1GB 10 4'30"
To to the same on your machine, simply load the scene and render it without any change. You can send me the results. It would be interesting to see how 6 core multithreaded processors improve render times with Vue Infinite.